Today I flew Wizz Air to and fro London. I’ve flown cheap intra-EU airlines before and the experience was miserable. Today it was almost pleasant. Below is 10-step guide to planning a painless Wizz Air trip. 1. Game the reservation experience. Navigating the Wizz Air website will take at least an hour. Don’t expect efficiency or logic in the process. Either assume a Super Mario mindset or sit down with a good glass of wine and savor the circuitous journey. 2. Splurge on priority boarding and extra legroom. Best $30 you’ll ever spend. If you’re really cheap (and a contortionist), at least cough up the $5 for the priority boarding. Makes all the difference. 3. Screen capture your purchase confirmation. Once you beat the Wizz Air reservation system and get a confirmation screen, immediately take a screen shot (commans-shift-3 on a mac; PrtScn on a pc). Proof of purchase is always a good thing and you’ll need your confirmation number to check in. 4. Check in immediately after purchase. One great thing about Wizz Air is that you can check in up to a month ahead of time. Yes, this eliminates your perceived flexibility (you have no real flexibility in these tickets anyway), but in my opinion, it’s well worth the imaginary risk. 5. Save your boarding passes to pdf and then print them. For normal airlines I email my boarding passes. Not with the cheapos. I save everything to my hard drive and print on good old paper. I repeat, PRINT YOUR BOARDING PASS. If you don’t have a printed boarding pass, you’re setting yourself up for hell at the airport. 6. Don’t check baggage. Be frugal—do you really need that third pair of shoes? Stuff everything into your carry-on. Then, with a printed boarding pass, you’ll avoid the gnarly check-in line. For regular airlines this is convenience; for Wizz Air, it’s a lifesaver. 7. Get to the airport early. What are you really going to do with those extra 30 minutes that you can’t do at the airport? The Budapest Airport has free WiFi so tweet your updates stress-free while standing in the security line. 8. Buy your airport transport on the plane. 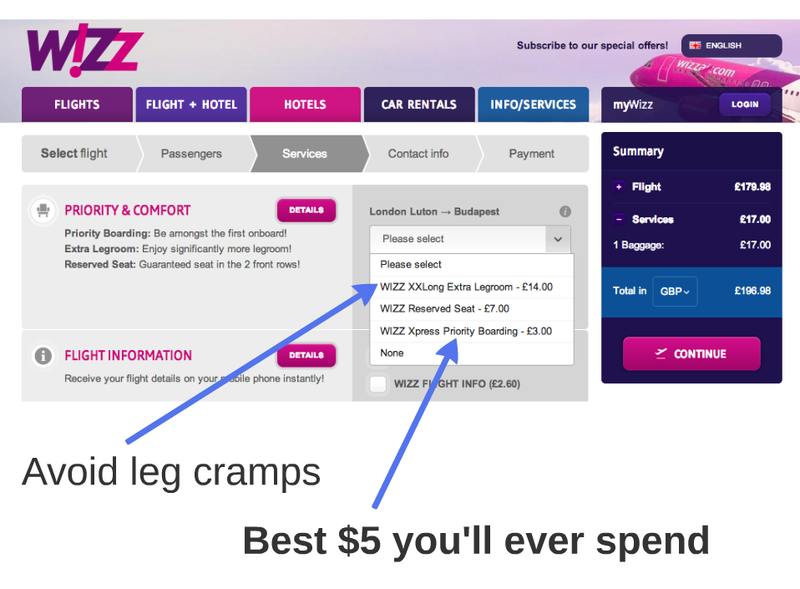 This is my favorite Wizz Air perk. Yes, Luton airport is an hour from London, but Wizz Air sells transport tickets on the plane: one-way or round trip. While purchasing, if you’re not an EU citizen, ask your flight attendant for an entry form if required (yes in the UK, no is most other EU countries). Keep your passport, boarding pass, and a pen handy so you can complete the form before you land. 9. Charge your iThings and download stuff. Whether its work or entertainment, you’ll have a lot of time without Internet, so plan for it. P.S. A friend who read this post sent me this hilarious Ryan Air parody. Enjoy. This entry was posted in Social Commentary, Uncategorized and tagged Ryan Air, Wizz Air. Bookmark the permalink.